Description: Attacked and abducted in her home territory, Mercy finds herself in the clutches of the most powerful vampire in the world, taken as a weapon to use against alpha werewolf Adam and the ruler of the Tri-Cities vampires. In coyote form, Mercy escapes only to find herself without money, without clothing, and alone in the heart of Europe. Unable to contact Adam and the rest of the pack, Mercy has allies to find and enemies to fight, and she needs to figure out which is which. Ancient powers stir, and Mercy must be her agile best to avoid causing a war between vampires and werewolves, and between werewolves and werewolves. And in the heart of the ancient city of Prague, old ghosts rise. Review: With ten books in the series, the Mercy Thompson series is still going strong. Silence Fallen is different than the earlier books in the series but it still maintains it trademark action, humor, romance, and suspense. Unlike the other books in the series, Silence Fallen primarily takes place in Europe and it was fun to step outside the Tri-Cities. Briggs does a good job in providing enough details about the new setting's history and folklore to make the countries come alive. I'm being vague on purpose as to avoid spoilers. Silence Fallen refers to Mercy's removal from her pack and from Adam. While I missed several my favorite pack members, it was nice to get Mercy on her own. This book really examined Mercy's fear of abandonment and showed how incredibly resourceful she is as a survival. Where many of us would cry and given in to our fears, Mercy doesn't have many "woe is me" moments but rather keeps a cool head and thinks things through rationally although she may not necessarily have control as to what comes her way. Silence Fallen also has a different narrative structure than the other Mercy books. The story is told in two different timelines and switches point of views between Mercy and Adam. Mercy is still written in the first person point of view whereas Adam's point of view is written in the third person. While I understood the rationale of having two timelines I felt it disrupted the story for me mainly because the chapters for Mercy were a bit too long and then it would quickly switch to Adam's timeline. Had the chapters been a bit shorter it might have flowed better. The other thing that was jarring for me was Adam's point of view being written in the third person, which made it less intimate. While his perspective was a nice surprise and added to the story, I would have liked to get inside his head a bit more. It was also nice to get back to the vampires. I forgot how tricky they can be! 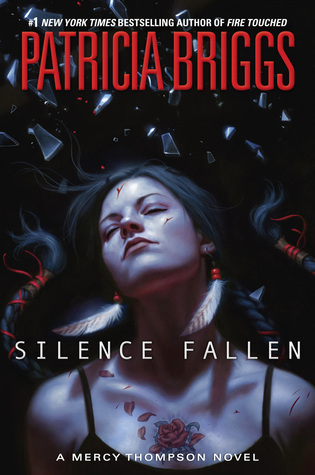 Overall, Silence Fallen is another great installment of the Mercy Thompson series. Words of Caution: There is some strong violence and some language. Suitable for mature teen readers and adults. I am glad you enjoyed this overall. I totally agree about the third person narrative for Adam. I am never a fan of switches like that. I adore this series and even though Adam and Mercy weren't together for most of this, I still really loved it. I liked this one, but it wasn't my favorite. I listened to the audiobook, so the third person narrative of Adam still felt intimate b/c "he" was speaking. But what I didn't like was that the publisher brought in a new, male narrator to do this chapters. It was not good b/c I am so used to Lorelei King, who is amazing!